I’m in it right now. It’s not words – there aren’t even words to describe it or personify it or explain it, really. But words are all I have for expression, so I’ll try. I feel flat: without shape or depth. I feel numb: without feeling or heart. I feel empty: without substance or worth. I feel sad, hopeless, lonely. Lacking. I’ve been thinking about Christmas, about how this year I don’t have the means to offer many presents or presents of great value to those I love. I’ve been thinking about the financial insecurity I’ve been experiencing. I’ve been thinking about everything I don’t have. And I can’t have those thoughts without thinking of her. She is forever missing. She is the original “missing” in my life. She is the “missing” that precedes all the other missing I do. The hole in my heart waxes and wanes over time, and right now it’s gaping. The tears pouring out are salty and they burn my eyes and my cheeks. They get bigger as the years pass. They don’t last as long when they come, but they hurt more. It’s been a decade now. This is the tenth Christmas I’ve had to endure without her. The tenth December I’ve spent, lonely but smiling, at family functions while my heart aches for the precious family member I’m missing. The tenth year I’ve sat alone with the pain of my loss, joyless and silent; pretending so no one but me has to feel awkward; choking on the tears I have to hold inside. Every year hasn’t been this difficult…this year, I feel like I’ve forgotten how to pretend, like my healing has regressed. I wrote my dumb letter today. I’ll send it in the mail tomorrow. Another letter for deaf eyes. Another year of unspoken rejection in the form of an unanswered letter and a promise broken, yet again. Hope? “Hope” is a fluffy, feel-good word used to hide weakness and inability. Hope is what you do when you have no authority, no say over what happens to you. After ten years, I despise the notion. And Christmastime is all about hope and joy, right? I wish I could buy into it. This road would certainly be easier to travel if I could pave it with soft and fluffy ideals to avoid the pain of the myriad cracks and potholes. Someday this season will be easier. It won’t be this year, but that’s okay because I’m strong enough to get through it. I’ll keep my head up and I’ll try to stay positive. Do you struggle in the holiday season? Tell me about it in the comments! 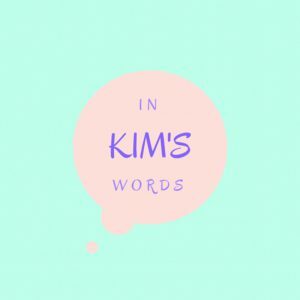 Remember to subscribe to In Kim’s Words to receive updates about new posts. Yes I do struggle each year at holidays. Christmas is when it all started for me. My pregnant mother was sick while pregnant with me. She went into the hospital two days after Christmas in 1955. My little body pushed through 8 weeks premature two weeks later. Mom died three months later. My Dad gave me away three weeks after that. If only I had died and Mom lived, then my Dad would have had his wife, and my four older siblings would have had their mother. I can’t even imagine living through that – I’m so sorry for your experience.